I have been using PC Wizard for last few years and got a little bored with it. At times I got lost in interface and it consists of multiply files and folders, which can be inconvenient for sync or quick download. SIW is one of alternative software and hardware informational utilities I had bookmarked (twice) to check out. SIW is single-file portable app that can report large amount of information about computer, including (but not limited to) such things as hardware, operating system and network configuration. Most of information is presented in informational area, next to navigation tree. 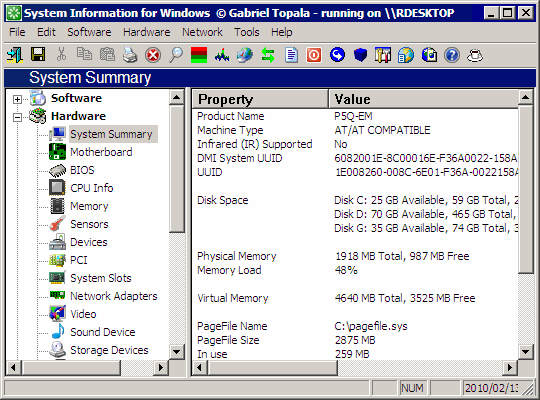 There are also some embedded tools and graphs that launch in separate windows. App does include shortcuts to some Windows system utilities in menu, but there is no way to make changes or launch related consoles from informational area itself. You can look, but you must figure out yourself where can be tweaks made in Windows. There is standalone version that works without installation natively, but it does create some DLLs in system temporary folder. I don’t really mind such behavior, but it would be better if they were created in app’s directory instead. Free version is for personal use only. It is fully functional, but lacks extensive report and command line options. I quite like how app is designed and that it is easy to use and transfer around. However personal use limitation is quite harsh because frankly there are just as good apps without such around. Check also HWiNFO32, is portable too. Heard about that one, but didn’t have it in bookmarks. Thanks! I checked SIW some months ago, but decided to stick with PC Wizard. Truth to be told, anyway, I always end up launching my portable version of Everest (I have Everest on my toolbox since 2004, maybe I just grew attached to it). I have an eye on Speccy too. It seems like a really nice option, though I guess it has to mature a little bit more. I’ve had this program on my sytem for years – many years. Long enough that I sometimes understand the information it offers up and long enough that I sometimes forget it’s there. The fact that I can’t actually do anything with it has never bothered me. Trust me, I shouldn’t be doing much tinkering in my system, but it does tell me where to find what I’m looking at in case I’m feeling reckless. I have Belarc installed also – only because it gives me something small enough to print out easily – but I really don’t see that there is any comparison between the two. I’ve never understood why people mention them both in the same article or comment (but here I am doing the same thing). SIW – as far as I can determine – tells me EVERYTHING. Speccy does good job with eye candy and will be good choice to give to remote [and clueless] user. But for now it is stuck in beta and info is very basic (it still manages to mistake chipset on my hardly new motherboard). I think I briefly tried Belarc but that was long time ago. Maybe should revisit it also some time. As I said, Speccy still needs time to mature. If you look at CCleaner’s initial releases, you will see Speccy has a lot of room for improvements and new features. And I believe it will be a wonderful app if Piriform continues to develop it the way they develop their other products. SIW is no longer freeware. Freeware versions may still be available on such as Softpedia, but the maker’s site no longer has any download links for the freeware; and the guy who runs the Bearware.info site wrote that he actually spoke with SIW’s maker, who confirmed that he’s done offering it for free. Sounded a little like the SIW guy is disgusted with it or something. The Bearwear guy is now recommending WinAudit. Had you actually looked at that site? I see links for freeware version present there just fine. I haven’t looked at this writing because I’m on my way out the door. But it wasn’t there a few nights ago; and, in fact, I even called the telephone number in the SIW web site’s WHOIS record and left a not-happy (but not abusive, of course) voicemail. It was two days later that I noticed that the BearWare.info guy noticed it, too; and communicated with SIW’s owner, who he said told him he was done with the freeware version. Maybe the SIW guy got so many complaints that he changed his mind. I’ll have to go look. But, godasmywitness, on something like Saturday or maybe Friday last, his site made a passing reference to the freeware version in two places, but there was no downnload link for it. I’m not imagining it. I’ll look later today when I get home.